Those corals are at the northern point of Lambumbu Harbor on the Northwest (leeward) coast of Malakula in Vanuatu. 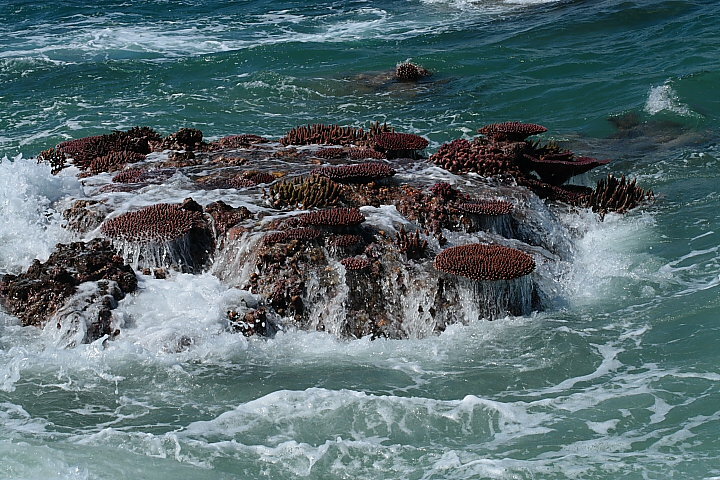 This photo was taken by Chris Maupin during daytime spring low tide which occurs during Austral winter. In an effort to make Jake’s head explode, I like to write about all the mistakes I make with my home reef system. Even though they may seem embarrassing, everyone makes bone head mistakes, and I think we all learn by hearing about others mistakes. Pretending they didn’t happen helps gives us a false sense of security, so here is how my day started at 5:15 am. After dreaming about Chris Maupin’s photo above of corals exposed at low tide, I woke up to get ready for work, went downstairs and something sounded wrong in the area of the tank. With a sinking feeling I took a look and the water level in the tank was about a third lower than it should be – meaning the top 6 inches of my reef, a whole lot of coral, was exposed to air just like in the photo above. Ran under the house to check the sump and it was half empty. Ran back upstairs and looked behind the tank, stepped in water, and started flipping switches so the pumps that were running dry could have a break. Turns out I had left the valve that fills my experimental auto feeder open and the tank drained overnight. What a nice thing to wake up to three days before a two week vacation. At least it happened at night when the lights were off and the fans weren’t running. I have written a lot about being prepared for disaster, and luckily I take my own advice to heart. I went back under the house, flipped a switch and delicious, mixed, heated and aerated salt water from the 200 gallon reservoir I always keep filled started filling up the system. Within ten minutes I had circulation restored and began cleaning up. I didn’t have much water to clean up because, as planned, it all went down the piping hole in the floor into the crawlspace under the house. I turned on all my circulation to blow the mucus off the corals that had been exposed. Most of the corals looked no worse for the wear, but we’ll see about the Seriatopora and Archohelia when I get home tonight (I expect them to be beaten but will recover). I even made it to work almost on time. Moral of the story, corals are amazing and can do well for a while even when exposed to air, planning for the worst makes your life easier, add an emergency overflow drain into your autofeeder (if it fills with via a pump), and know that mistakes will always happen (mine seem to happen about every two years).